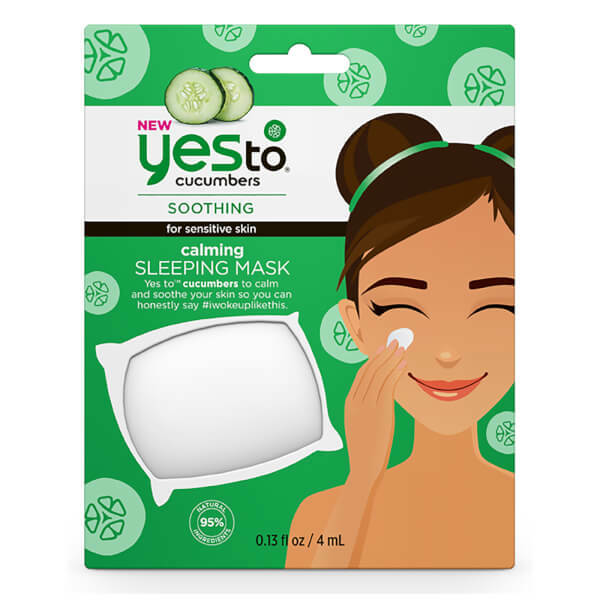 Get a relaxed night’s sleep with Yes To Cucumbers Calming Sleeping Mask, a lightweight face mask that will keep your face cool all night long. Containing Cucumber Extract to calm and soothe your complexion, this single use mask will help ensure you wake up soft, smooth and refreshed. The formula soaks into skin easily and won’t transfer onto your pillow. Free from parabens, SLS and silicones. Open card at perforation to release the sachet. Gently pull the notch of the sachet to open and reveal the perfect amount of Sleeping Mask needed for overnight. Apply mask all over face on freshly cleansed skin. Feel free to relax and give yourself a mini face massage as the formula absorbs. We’ll wait here. Tuck yourself in, turn off the lights and let the mask do all the work while you sleep! You’ll wake up to a clean pillow and beautiful skin. Rinse off and get ready to face a calm day! Water/(Aqua), Cocos Nucifera (Coconut) Oil, Aloe Barbadensis Leaf Juice, Glyceryl Stearate, Butyrospermum Parkii (Shea) Butter, Glycerin, Behenyl Alcohol, Simmondsia Chinensis (Jojoba) Seed Oil, Theobroma Cacao (Cocoa) Seed Butter, Cetearyl Olivate, Sorbitan Olivate, Cucumis Sativus (Cucumber) Seed Extract, Cucumis Sativus (Cucumber) Seed Oil, Persea Gratissima (Avocado) Oil, Camellia Oleifera Leaf Extract, Brassica Oleracea Italica (Broccoli) Extract, Chamomilla Recutita (Matricaria) Flower Extract, Peucedanum Graveolens (Dill) Extract, Spinacia Oleracea (Spinach) Leaf Extract, Tocopheryl Acetate, Glyceryl Caprylate, Xanthan Gum, Stearic Acid, Ethylhexylglycerin, Pentaerythrityl Tetraethylhexanoate, Sodium Hydroxide, Phenoxyethanol, Fragrance (Parfum).